Earl Handy reaches for a bill in his restaurant collection. Numismatics refers to the study and/or collecting of currency, and might bring to mind hole-in-the-wall businesses run by bespectacled, white-haired gentlemen, or nostalgic county fair stalls, or maybe even the flash-in-the-pan 1990s game Pogs, which briefly made coin-like discs all the rage. 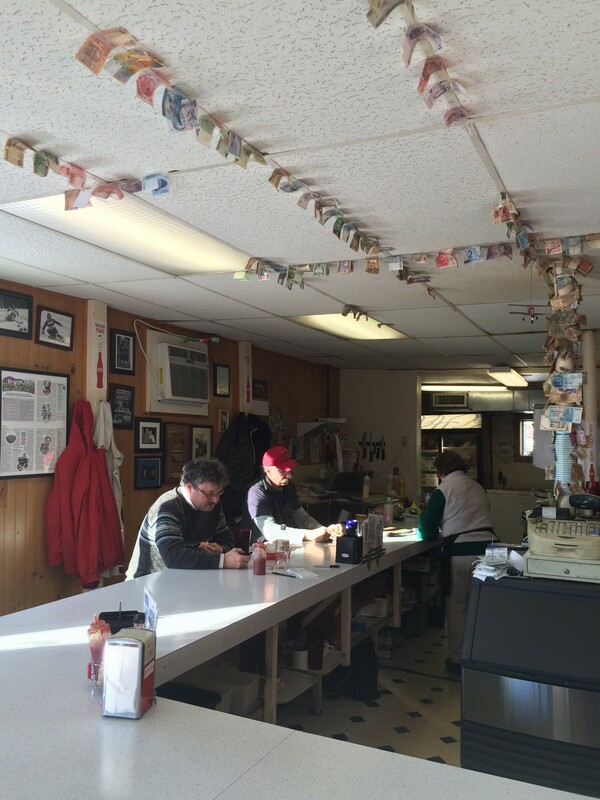 Handy's Lunch in Burlington, however, has its own far less calculated brand of numismatics — though proprietor Earl Handy certainly recognizes the allure that an in-house collection gives to his business. "You’re sitting in a diner, you’re waiting for your food to cook," he told Seven Days over the lunch counter. "You can see me cooking your food, and Mary [his sister] is there visiting with you. It’s kind of neat, when you look up, there’s something on the ceiling." Handy explained that the overhead collection of paper currency began with Kevin Myers, a regular who had recently returned from a trip to Europe. 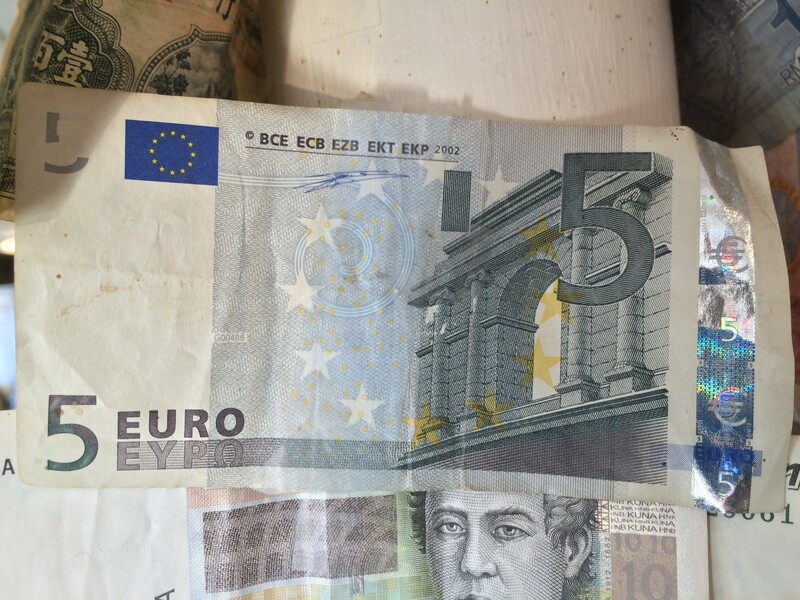 Accounts differ slightly between the two, but what's clear is that the first bill in the collection, a five-Euro note, was taped to the post as a result of good-natured razzing between them. Handy remembers that Myers tried to pay for his breakfast with the bill and, despite Myers' insistence that it was worth $10 U.S., Handy rejected it. Instead, he said he decided to "hold it as collateral — to jab [Myers] more than anything. 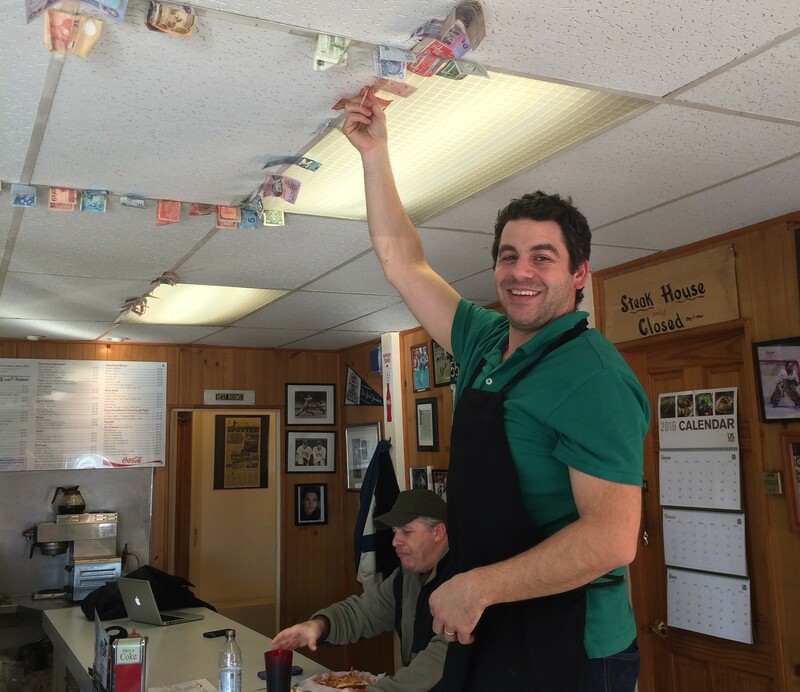 So we grabbed a piece of Scotch tape and we put it on the post above the register." Myers recalled in a telephone conversation that the collection started as "two dudes breaking each other's balls. It was kind of a joke." According to Handy, over the next few days, he acquired bills donated by customers who had notes from Indonesia and Jamaica. "It was just like, Here, put that on the post," he said. "That’s how it evolved." Later he decided, "This is gonna be my 'Mona Lisa,' my piece of art." He estimated it took at least a year to cover the pole with bills. Then, Handy explained, "With there being no room left on the pole, we started working on the ceiling, we spider-webbed out. Now I’m hanging them where people sit, taping it right then and there for them while they’re sitting here." Not all of the taped-up items are foreign currency. 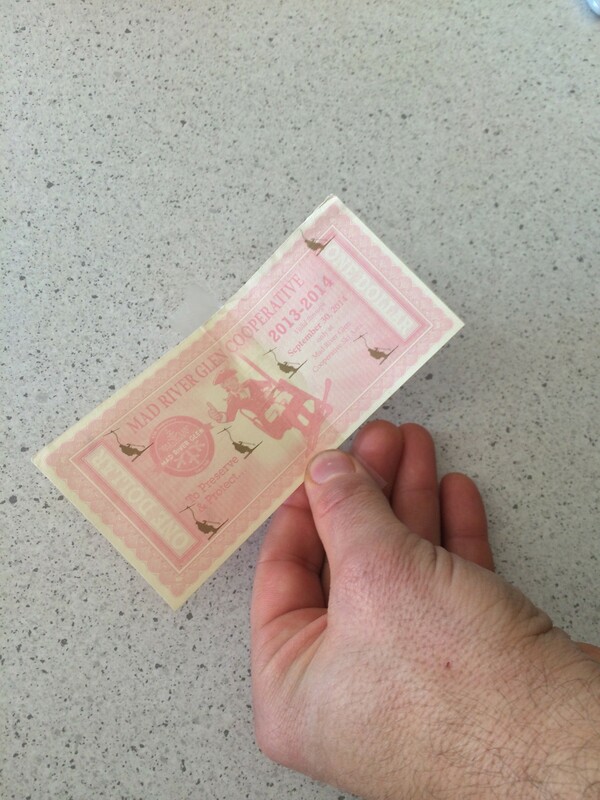 Handy points out an American dollar bill given to him last year by "some good ol' boys" (alternately described as "’Mercans") who asserted, "This is America, we need some American [bills]!" Also pasted up are hyperlocal notes: a dollar from Mad River Glen Cooperative and a five-cent bill from Canadian Tire. And deviating from the idea of currency altogether is a piece of notebook paper covered with signatures and notes from a group of young tourists who visited the restaurant during a Trek America tour. Emphasizing the worldly flavor of the collection is an intricate biplane model suspended over the register, made entirely from Coca-Cola cans. Handy recalled purchasing the handmade plane while visiting London for his brother's wedding. He thought, "I’m such a Coca-Cola restaurant, I’ve gotta buy one." "You never know, one day we might cover the whole ceiling," he said. "Then I’ll take it all down and cheat on 'The Amazing Race.'" Special Collections is a blog about collections and collectors in Vermont, as well as the peculiarities and politics of material culture writ large. From institutional archives to your grandma's miniatures, we dig into how things become more than just things. Are you a collector? Have a tip? Email rachel@sevendaysvt.com.